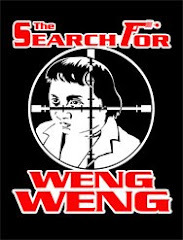 Cheuk Pak-tong directs this gritty horror exploitation flick about Peter Yu (Chin Han), a vacuum salesman who, at the film's outset, catches up with his wife Nancy (Sally Yeh Chian-wen) who relaxing at her uncle's estate outside of Luzon in The Philippine. There Peter makes the mistake of helping local girl Marianna (Anna Malai) who is running from forced marriage with a brutish tribal leader. Later, when Peter returns back to Hong Kong, he discover Marianna has followed him home, begging for help. When Nancy returns not long afterwards, she finds her husband in the sack with the lass and heads back to Luzon. Desperate to salvage his marriage, Peter hurries back to the Philippines himself, but in so doing raises the ire of Marianna's would be husband, believing that Peter is looking to claim the lass -- who has hence returned home -- for himself. Later, when Nancy and Peter get lost in the jungle, the tribe attacks, along with some zombies. One of Sally Yeh's very first roles and one she probably has long since forgotten. It can't be erased from any resume though and in some shape or form, Marianna is still in circulation. Trying to combine a triangle drama with nods to The Texas Chainsaw Massacre and any other cannibal flick from the 70s, the movie surely is an entertaining brew due to it being so utterly incompetent but you'll have to be a good mood switcher to get through it. With not only dreadful acting from Sally (there's not a whole lot to work with here though) but from the Filipino cast as well, entertaining, although I hesitate to call them redemptions, come through the use of some wicked, psychedelic sound design and the needed excess in jungle climax. It's bad enough to be fun and short enough to be bearable. This is another one of those 1980s films that I think must have been financed by the HK Tourist Board. Their motto might be “Stay at Home. It’s a Scary World Out There!”. The basic theme of these films is that when a Hongie travels outside of China – in particular to the exotic lands of South East Asia – there is danger lurking – death waiting. This fairly unknown Sally Yeh movie may have been her very first film and it co-stars Chin Han – best known to Western audiences for his pairings with Brigitte Lin – both on screen and off – during the 1970’s. The film takes a while before it gets cranked up, but the last thirty minutes turns into a savage, brutal and frightening fight for survival among the wilds of the Philippines. Chin Han – Sally’s husband – goes off on a business trip to the Philippines leaving his lovely wife and two children behind him. While conducting business there he saves a desperate girl from a number of pursuers. The girl is Marianna and she is the cause of a deadly rivalry between two native tribes. The leader of one of the tribes wants to marry her, but Marianna and her tribe wants nothing to do with them. Marianna escapes to HK where she finds Chin Han and persuades him to hire her as a maid so that she can hide out. Sally isn’t too keen on the idea especially when she comes home unexpectedly one day and finds her husband and Marianna playing house in the maid’s room. Chin Han had boasted earlier on to his male colleagues that he was “promiscuous but had never been caught yet”. His luck just ran out. Sally leaves HK to visit her relatives in the Philippines and Chin Han follows to make amends. They decide to go off on a road trip where hopefully they can begin again. But this is the Philippines and road trips away from civilization are never a good idea. Their scenic tour goes askew immediately and soon turns into a horrific nightmare. First some kids drain most of the gas from their car and they soon find themselves out of gas and surrounded by a band of grasping zombie like lepers. Events though take a turn even for the worse as they fall into the hands of the tribe that is after Marianna. At this point the film becomes extremely violent and gory as Chin Han, Sally, Marianna and some of her tribesmen fight their way out with machetes and spears and run for their lives in the jungles with a tribe after them with vengeance on their minds. It’s always a pleasure locating an obscure film such as this and it turned out to be much better than I expected. Considering that this might be Sally’s first role, she does a terrific job as she goes from pampered housewife to jealous outrage to total panic and fear. I believe that is also Sally who sings a couple songs for the soundtrack. The VCD has subs and the quality of the transfer goes from poor at times (in particular the dark interior or night scenes) to at other times looking quite good.